Okay, day 12 of our 50k writing challenge and my 100k editing challenge, and I’m nowhere near the mark. It’s been a strange week with a day and a half of it spent in a migraine fog. Then there’s all the new ‘toys’ I’ve been testing for Romance Writers of Australia, leaving little time to actually edit or keep my head in the story. So on Friday night I decided to do a light edit – and I’ve dubbed this ‘the rinse cycle’ – another chance to go through and remove all the dirt. In Microsoft Word, red squigglies indicate a possible spelling mistake and green squigglies can be anything between a fragmented sentence, a dreadful grammatical faux pas or simply two spaces where there should only be one. The rinse cycle is tackling the squigglies – removing those extra spaces, correcting spelling, deciding whether Bill Gate’s green grammatical slap on the hand is warranted or not. It’s a light edit and doesn’t require intensive brain power (which suited me very well this week) so you can still be productive even when you don’t have the mental energy to tackle a deep edit. 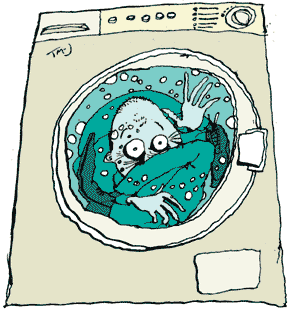 The rinse cycle can be applied at any time during the writing/editing process. You may want to do your first rinse cycle on your previous day’s words before you start writing again for the day. Me – I tend to just jump straight into the next scene so I end up with many pages requiring rinse cycles. But it is a good way to get your head back into the story and reacquaint yourself with your characters. Thankfully, today is only the second day of the long weekend, so I still have a chance to redeem myself on the editing front. The program for Bryon Bay Writers Festival was released on Friday, and I spent Friday night and yesterday morning trying to work out the logistics of spending almost a week in Byron Bay to do two workshops prior to the festival. But the weekend before I’m in Sydney for the Moving Pictures concert and not flying back until Tuesday. I looked at the option of changing my flight to go to Ballina instead of Coffs Harbour but a cheap flight means I can’t change the route. So instead I will keep the flight as is, and go to Bryon two days early so I can do the Fiction Masterclass with M J Hyland. Ooh scary stuff, a critique of 1000 words and critting other masterclass students’ work. But I said, that this is the year that I learn as much as possible about writing and editing craft and this will be another great learning opportunity. So it’s 60 days until the Romance Writers of Australia conference in Melbourne, 47 days to long service leave and the Moving Pictures concert, and 52 days to Bryon Bay. Let’s not even think about what I committed to edit in that time – I’ll just go back to the rinse cycle now.